Taiwan Semiconductor Manufacturing Co. (TSM) is sliding and is causing the shares of other semiconductor companies to slip along with it after a downbeat forecast of what lies ahead for the company, and likely the sector. Shares of the world's biggest contract chipmaker and a lead supplier for Apple Inc. (AAPL) were down about 2% before Thursday's opening bell after Taiwan Semiconductor officials voiced concern about the sharp slowdown in global smartphone demand, something Apple itself suggested in its pre-release earlier this month. "Moving into first quarter 2019, we anticipate our business will be dampened by the overall weakening of the macroeconomic outlook, mobile product seasonality and high levels of inventory in the semiconductor supply chain," Taiwan Semiconductor CFO Lora Ho told analysts in a conference call from the company's Hsinchu, Taiwan, headquarters. Ho made clear the inventory issue is due to lower demand and not a supply glut, and she tied it specifically to high-end smartphones, a serious problem as Taiwan Semiconductor draws 45% of its revenue from smartphones. Taiwan Semiconductor did report a small beat on top- and bottom-line results for the fourth quarter, but the demand forecast is what is moving the market. First-quarter revenue is expected to come in between $7.3 billion and $7.4 billion, which would be well below the $7.86 billion estimated by analysts and would be down about 14% from a year earlier. Taiwan Semiconductor also trimmed its expected capital expenditures amid the more difficult environment. "Due to the macroeconomic outlook in 2019, we are tightening this year's capital spending by several hundred million dollars to a level of between $10-$11 billion," CFO Ho said. As a result of the report and Taiwan Semiconductor's tempering of estimates, Fubon Financial analyst Sherman Shang downgraded the stock from "Buy" to "Add" and trimmed his price target. "Our downgrade reflects our more cautious view about 2019," Shang wrote in a note to investors. "We expect a sharper-than-expected correction in the first quarter from macro uncertainty and shrinking demand from almost every application." Shang added that a recovery likely will take time as key customers clear inventory. 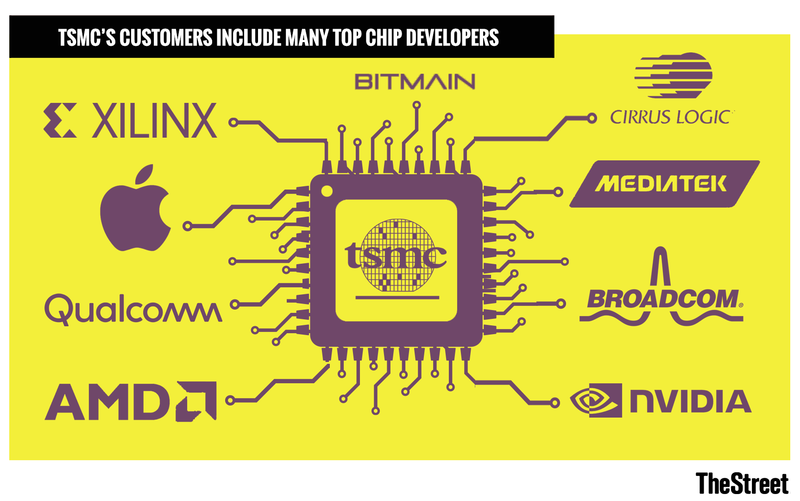 "TSMC will likely miss its 5%-10% year-over-year growth target for 2019 given the very weak first half of 2019 and the declining contributions of some customers," Sang said. Taiwan Semiconductor's demand forecast, which marks its steepest revenue decline forecast in a decade, is not a good sign for Taiwan Semiconductor customers such as Apple, Qualcomm Inc. (QCOM) , NvidiaCorp. (NVDA) , Advanced Micro Devices Inc. (AMD) and Broadcom Inc. (AVGO) and for other semiconductor stalwarts that rely on similar demand drivers; those companies include Intel Corp. (INTC) , Texas Instruments Inc. (TXN) , ASML Holding N.V. (ASML) and STMicroelectronics N.V. (STM) . The aforementioned stocks are sliding in pre-market trading as the market begins to contend with what their respective earnings calls could hold toward the end of January and how long smartphone demand will take to recover.